I want to thank, NYS Bureau of EMS Director Ryan Greenberg for visiting with us in the Southern Tier last Thursday. His trip to the area began with our site visit for the HRSA Pediatric Emergency Care Coordinator grant with EMS for Children Program Manager Martha Gohlke and Terry Fisher from the National EMS for Children Innovation and Improvement Center. This was a great opportunity to share the success of the #NYSPECC program that began in October. 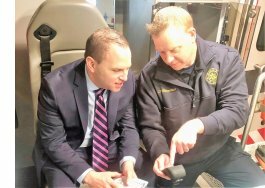 Following the site visit, Director Greenberg toured several EMS agencies in the Southern Tier. I would like to thank City of Olean Fire Department, Trans Am Ambulance Services, Mercy Flight, ALSTAR EMS and Randolph Regional EMS Corp for welcoming Ryan and I at their facilities. I have been asked to serve on the advisory committee for the development of St. Bonaventure University's Physician Assistant program. I attended the first meeting of the committee in which we will work with the faculty and staff of the SBU PA program to ensure the program is delivering learning that is current and relevant to the health care needs of the Southern Tier and surrounding areas. The advisory committee will make recommendations to the program to ensure it produces graduates with the skills required to meet employment needs. James E. Tkacik, MMS, PA-C, Director of Clinical Education, Physician Assistant Program for including me on the advisory committee. Please feel free to contact me if you have any questions or concerns you would like me to bring forward to the committee.